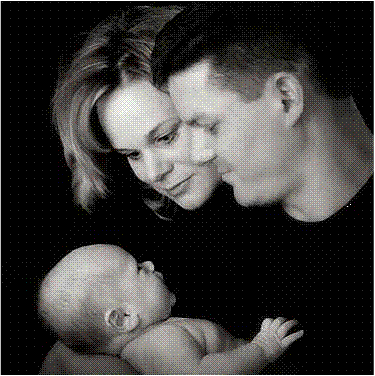 David J. Kinman, was diagnosed with stage IV Colorectal cancer at the age of 35. This came as a Huge shock since David worked out 6 days a week, did not smoke or drink very much. He had been experiencing some abdominal cramping, extreme fatigue, and bouts with blood in his stool off and on for a few months. He chalked this up to over doing it and did not think too much of it. It finally got to the point that he needed to get it checked and made an appt with a doctor at Ingersoll Family Physician, Dr. Khan. We truly owe her a lot because she thought it was probably an internal hemoroid but since his grandfather died of Colorectal Cancer at the age of 86 she wanted to error on the safe side. We were immediately sent to Dr. Sue Beckwith to discuss getting the tumor out. She performed a colon resection on 6/21/05 with great success. At the time we did not think it could get much worse, but it can and it did. Dr. Beckwith gathered both of our families and told them the most devastating news any family should ever have to hear… “David is extremely sick and I do not think he will make it much longer than 9 months” the cancer was in the liver, and droppings were seen in the pelvic area. Stage IV Colorectal Cancer was the diagnosis and 9 months was the prognosis. We all were in shock and not able to believe that this was truly happening to our family. After a few weeks of the news sinking in we geared up for the fight of our lives. David met with Dr. Behrens, oncologist, and told him that he did not know how to lose or plan on losing. He wanted someone that was willing to be upfront and to fight along side him even when the odds were against him. This is when the world of chemo, radiation, and side effects entered our lives. David was able to remain positive as long as he was able to do the things he loved to do. He loved to be active and to play as many sports as he could. He did not believe in doing anything half way and that is how he approached cancer and the treatments. He always tried to have something to look forward to on the weeks that he did not have chemo. He swore that this helped him get through the bad weeks. David responded to chemo and the tumors shrunk or remained stable throughout. We still needed to do more in order to and save his life. We looked into alternative treatment options and found Sir Spheres, which is a procedure where micro spheres are injected into the liver and radiation, is expelled into the tumors. This procedure was developed for liver cancer patients but colorectal patients started benefiting. We had to travel to the University of Iowa Hospitals because it was not offered in Des Moines. Insurance denied us and we sent letters to the Insurance Commissioner with no success. We were truly blessed to have an angel, Suri Sehgal, donate $65,000 to us to have the procedure performed. We cannot tell you how grateful we are and is the reason we are creating a foundation to help other people. Because without him David would not have seen his son’s first birthday or spent as much time with his wife and family.